Daniel Abt scored his second Formula E victory this season and the second in a career today at Berlin ePrix, the ninth round of the FIA Formula E Championship. Abt has won a race after starting from pole and setting the fastest lap. This victory moved him to the fourth place in the championship standings with three more races on a calendar. 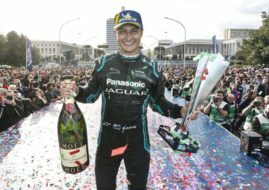 Audi Sport Abt Schaeffler has a double celebration because the defending champion Lucas di Grassi joined Abt on a podium after finishing second at Tempelhof Airport Street Circuit. It’s the fourth consecutive runner-up spot for Di Grassi. He’s now sixth in the championship points. Jean-Eric Vergne (Techeetah) finished third in Berlin and extended his championship lead to forty points ahead of Sam Bird (DS Virgin Racing), who finished seventh today. Felix Rosenqvist is third in the championship classification after not scoring points today. He has 86 points and still has mathematical chance to win a title but, realistically, it would be a two-man battle between Vergne and Bird. The next race, Zürich ePrix, is scheduled for June 10.